My favorite method of cooking asparagus is to roast it in the oven. But you want to do this with the thick stalks of asparagus, for the skinny ones you’re better off using them in something like curry or pasta. Eric and I love asparagus and it’s a simple side dish that is perfect at the end of a long busy day. Speaking of long busy days, the house is almost finished! Our biggest problem was the bathroom, not only was there a huge rat’s nest under the tub because someone left the floor under the tub open to the crawl space, but the floor and walls were moldy and large parts needed to be replaced. Basically, we rebuilt the whole bathroom. I put in over 110 hours in 9 days!!! It will all be worth it though. I’ve also been planting a small garden, most of which will be herbs. We don’t really need to grow much because we get a TON of produce with our CSA, but I’ve always dreamed of being able to go out my kitchen door and pick my own herbs and tomatoes fresh from the garden. 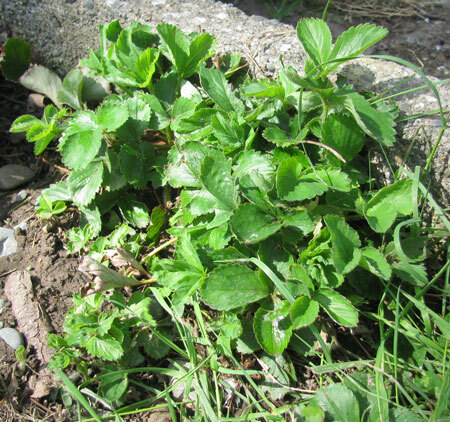 When we moved in there were quite a few mint and strawberry plants under the kitchen and bathroom windows. 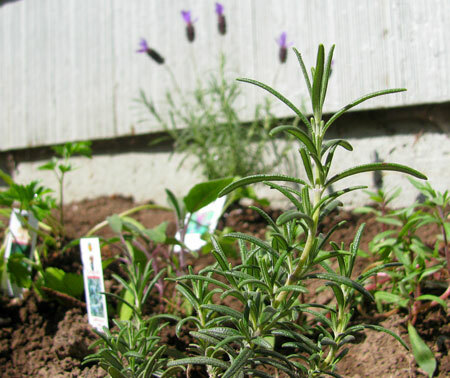 I’ve added some lavender, oregano, thyme, chives, savory, sage, three different kinds of basil, parsley, scallions and rosemary. You can expect to see lots of fresh herb recipes coming up, but especially mint ones as we have a TON of that! Hopefully we’ll be moving in on Sunday, I’ll have to show you guys some before and after photos this week. The difference is amazing!!! We actually went grocery shopping last night, the first time in about a month. (Yes, it’s been that crazy). Finally I could really cook something from scratch, no frozen meals or (even worse) fast food. We’ve had more fast food in the last month than we did all last year. Fortunately I’ve been doing so much construction that I’ve actually lost weight and gotten nicely toned. Flipping houses is great exercise! But I’m so relieved to get back to eating healthy again. This is the asparagus we picked up last night. 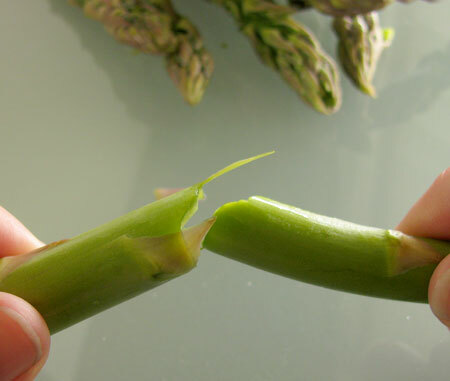 When you trim asparagus, it’s better to bend the base of the stem until it snaps. That trims the tough woody parts off right at the edge, whereas if you cut them, you might cut off too much or not enough. To find the perfect spot, simple grab the asparagus at the woody end with one hand, and in the middle with the other. Bend the asparagus until the end snaps off. Perfect! Below is the recipe for basic roasted asparagus, my favorite method for cooking asparagus. You can serve these as is, or drizzle your favorite vinegar over it. I like to drizzle it with our cabernet vinegar that we just can’t get enough of. You can also add them into dishes after roasting them. I piled it onto some Chinese Oyster Chicken and rice for today’s lunch. How do you like to play with asparagus? Preheat the oven to 400 degrees. 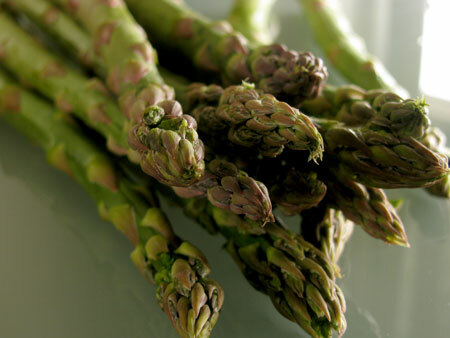 Place trimmed asparagus in a shallow roasting dish large enough to keep them in one layer. 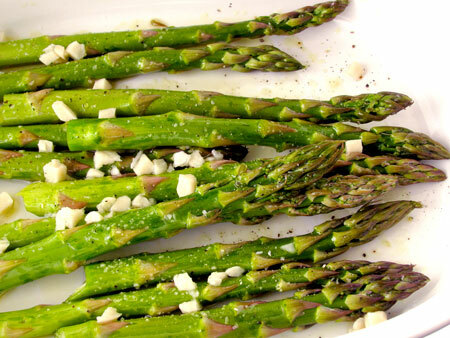 Drizzle with olive oil and stir the asparagus around until they’re all coated in it. Sprinkle with salt and pepper to your desired tastes (I use a pinch of salt and a couple turns of the pepper grinder). Roast in the oven for 10 minutes. Approximate cost/serving: At Sam’s Club it was only $2 for about 40 asparagus spears, so it comes out to around 30 cents a serving. Vegetarian/gluten free: Yes and vegan too! Congratulations on finishing up the house! Can’t wait to see before and after pics. We love asparagus a bunch of ways but our favorite for the really thin asparagus is to place them in a microwaveable dish that has a bit of water, lemon, butter, and herbs cover and zap for 1 1/2 minutes, stir and zap again. 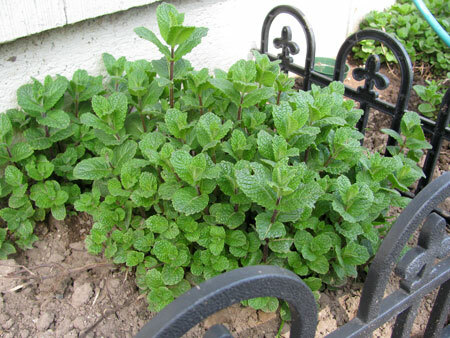 Mint grows like crazy – you may want to plant it in a container (and plant the container). I love microwaving the skinny asparagus to Carrie! I’ve thought about that with the mint. For right now it seems to have stayed in one area, but if it starts getting crazy I’m digging it up! Dido on the mint! It will go E-V-E-R-Y-W-H-E-R-E!! If you do eventually pull it up, make sure you dig the soil really well. It will grow back if any roots are left intact. I figured that out when I pulled my mint bed up for the second time. Oh and my favorite asparagus is steamed and tossed with some fresh squeezed orange juice and a dash of olive oil and salt. The same dressing works even better for broccolini. Or you could stir-fry the asparagus and add some salt and cayenne pepper and other spices…. Asparagus is a favorite vegetable at our house. I can’t believe I lived 23 years before trying it. I am so glad I picked it up at the market on a whim. Our favorite way to eat it is drizzled in olive oil and roasted. If I am feeling fancy I will sprinkle a little shredded Parmesan cheese on it. Just recently we grilled a bunch of asparagus, it was wonderful. 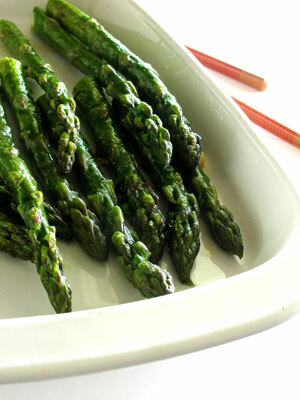 I love simply prepared asparagus- I roast mine a lot with sliced almonds- so yummy! Congratulations on the house Diana! I can’t wait to see the photos! We love asparagus…roasted, steamed, in pasta. Yum!! Asparagus-another good excuse to consume garlic!